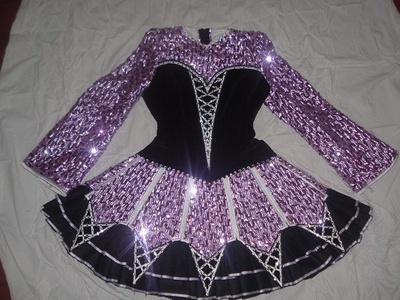 Chantelle Domican dress in black velvet with medium purple sequin overlay on shiny material. 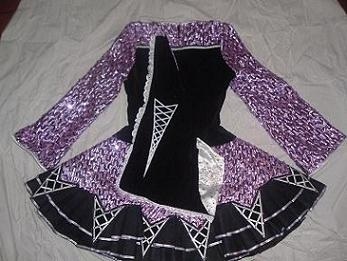 Skirt is single panel, bottom “ruffles” are made of black netting. Skirt moves nicely. Underskirt lined in black satin, bodice is also lined. Sequined material really sparkles! 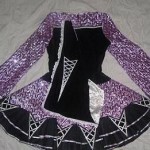 Dress is in great shape and has been carefully cared for. Cape, matching sequin headband and extra crystals included. Asking Price: $US875. Shipping costs not included. Will accept returns and refund the cost of the dress, buyer to pay all shipping costs.